Here’s part I if you haven’t read it. 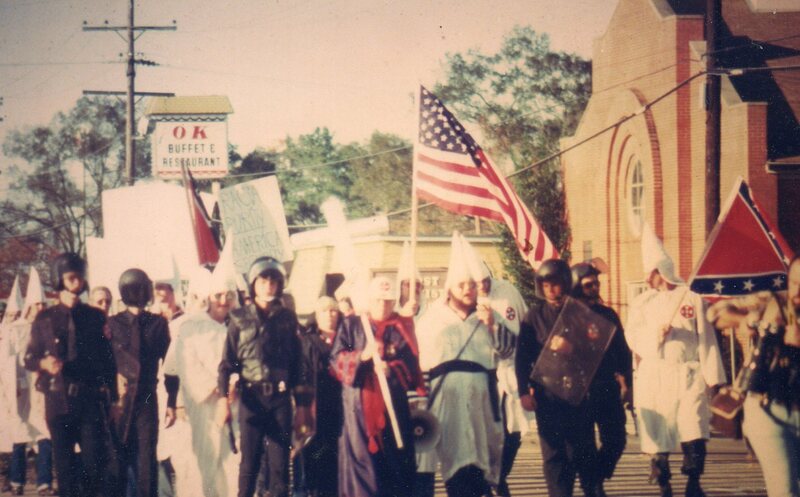 The Klan marches down Main Street of Vidor, 1985.
a shouting match between Herman Milquetoast and Ethel Merman. Vidor High Pirates basketball team 1955. Martin Luther King Jr. would be 69 today. 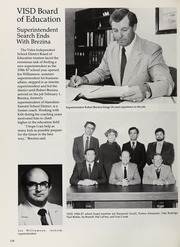 Bob Brezina was in his second year as Vidor ISD superintendent. herself and returns with the “new” superintendent, now in his second year at Vidor, Robert Brezina. year-old who possessed six marijuana cigarettes at school. aware of its students’ reputation as poor white trash racists. 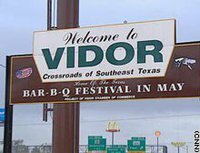 she asks him where he’s from and he tells her, she says ‘Vidor? in the past 22 years. than in “the home of the Ku Klux Klan”. in their future, but a source for enlivenment in the present. 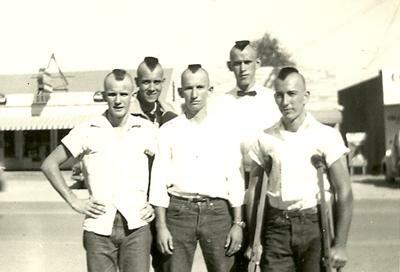 responsible for it: the Vidor High School class of ’69. most popular talent and fashion shows, five years running. walk the fashion plank during the “Daytime and Career” segment. sportswear booth near the back of the auditorium. Dead silence. country singer in the world, right? !”, he accents with a hoot. influx continues, though it’s a mere trickle of its former gush. his four-point checklist for determining Vidorian housewives. them at least six rings to get them to the phone on Wednesdays. auctioneer Tommy Ard work harder for his 15% than he wants to. takes turns displaying the items as they are auctioned. for sale in the front of her shop on the I-10 feeder road. with a Southern twang and you’ve got it. station and that Bon Jovi sounds much better that way. gotta go’. ‘We gotta go’, you got it? OK, from the top. sighs, and is soon out the door. Vidorians talk a lot about the crime rate in Beaumont. if not for the Klan, Walmart’s would sell ski masks year round. five serious crimes per 100 people during the same time period. clumsy voices will meld to make a joyful noise. clothes, together with his family, singing the hymn on page 67.
of Vidor who are willing to go to prison for killing them. That’s the black and white fact of the matter. the pond to plead compassion from a hunter who squints away. stamping cans of grapefruit juice. packages with black faces were put out at all. This entry was posted on June 15, 2012 at 12:29 am	and is filed under Uncategorized. You can follow any responses to this entry through the RSS 2.0 feed. You can leave a response, or trackback from your own site.